You can get it here. Click ‘Read More’ for configuration informations. This gadget use the onlinesig.dat file eMule generate to display a few infos, like server you are connected on, upload and download rate, and clients queue length. 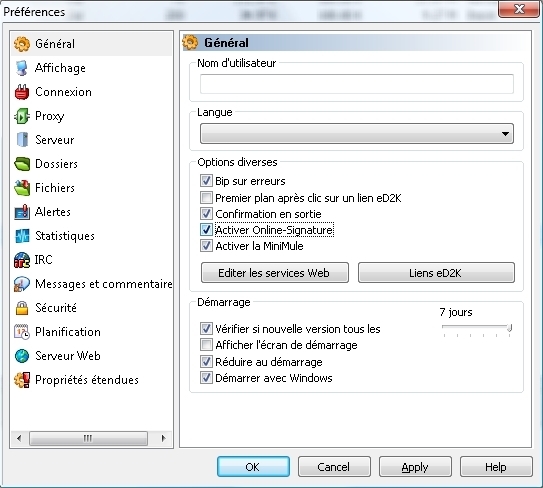 To make it work, you need to set the folder emule is running in (and where the onlinesig.dat file is) in options. Edit: Thanks to garfunkell, now, with the last version of eMule, the onlineSig.dat is located in the appdata folder under vista ( C:\users\–username–\appdata\local\emule ). 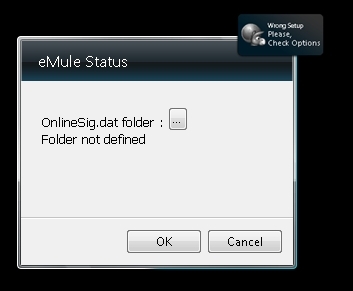 And you need to configure eMule to generate the onlinesig.dat file. That’s all folks, feel free to improve it, but please, if you do so, leave a message with a link to the one you made. yayyy!!! at last i found one…cooll..luv ur gadgets…. Nice, I thought I was going to have to write one of these. Only bug I found is it can’t tell if you shut eMule down… it continues to give the last data received. There should be some sort of check for a connection. Maybe if the onlinesig.dat doesn’t change for a set period of time it should assume no connection? Hi, my problem is that i can´t find any .dat file in my emule directory, so the gadget doesn´t work. Are you sure you activated the OnlineSignature in the options ? If yes it should be here, unless you use a non standard client (a modded one) and this function have been removed. I added the ability to show the emuledailylog in a flyout so I can view problem/downloaded files without opening the remote desktop on my mule machine. write me if you want it. What i have to do with the xml and other files that i obtain in emule.zip file? ummm im lost as well, I downloaded the zip unrar’d all that is in there is images folder, a settings html icon, and a emule html icon, and a Gadget xml document, i opened emule, allowed signature, and then chose to run xml via vista but nothing shappens? Is there a file missing? Any info would be appreciated. And I ‘ve an another problem : where is the onlineSig.dat in the emule directory? Thanks for this fantastic gadget and for the help! Great gadget guys !!! I’ve searching for something like this for a lot time ! Please keep me informed for updates ! thanks for this great “Tool”. We love it! Could a resetable option be included for total upload, total download and TOTAL net traffic? Like an trip odometer? Hi! I’m using a sidebar in XP and emule 0.49c but I can’t find onlinesig.dat anywhere. I don’t have an appdata folder, and it’s not in the emule folder. Any idea? Hi again! I found the appdata (hidden “Application Data”), pretty dumb of me.